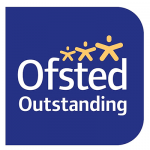 OFSTED are the government body that inspect and regulate all childcare settings. We are very proud that at our last inspection of the nursery we were judged as an ‘Outstanding’ Provider of Daycare. Staff know the children and their families very well. They adapt their nursery routines to reflect on children’s individual needs. This means that new children settle quickly. Staff display resources attractively and ensure that they are within the children’s reach. As a result, children show great independence in choosing what they play with. Babies explore and access a wide range of sensory and musical toys, which develops their learning. Staff consistently reinforce their expectations for children’s behaviour. They are excellent role models to children. Staff have an excellent understanding of how young children learn. They extend children’s learning, reflecting on their individual interests, and follow the directions in which children lead their play. For example, children worked as a team and created a spaceship in the woods. Staff extended their levels of mathematical learning. They incorporated an understanding of size and shape as children collected the resources they needed in their natural environment. We are constantly working together as a team to achieve excellent daycare, and welcome our next Ofsted visit. Through open communication with parents we are responsive to feedback and suggestions. We strive to ensure that Footprints Nursery is the very best there is to offer your child. Please feel free to read though the Footprints 2015 report by directly on the Ofsted website.